I hesitate to pass summary judgement on Stephen King’s short, taut zombie thriller “Cell” because after all is said and done, it stands – as all of King’s work does – pretty well on its own, and even tweaks the genre somewhat. It’s flaw, if flaw it could be called, lies more in the denouement and inevitable comparisons with other King works, than any inherent weakness of its own. The problem partly lies in the apocalyptic nature of the story, which to many will immediately reference “The Stand” (also a Liquorature selection). As in that seminal work of dark Christianity, modern technology becomes the vehicle for unwittingly destroying its creators, though whether this is deliberate or accidental is left mostly implied than stated outright. And once the bodies start decaying, the survivors begin to regroup and search for meaning and order, go on a quest of sorts, and there is the development of mystical or PSI powers which informs so many of King’s stories. Do these similarities derail “Cell” or do they enhance it? Are they a subtle wink from the author? Maybe. There’s no question that “Cell” possesses its own uniqueness. Part of this derives from its breakneck pace (it is one of King’s shorter novels), and indeed, it lacks the mythical undertones of “The Stand” and reads more like a pulp novel…a Bachman book, in fact. The plot concerns the metamorphosis of cell phone-using humans into mindless zombies who attack and kill anyone without rhyme or reason after having been exposed to what is referred to as the Pulse during their useage of these devices. Somehow this short circuits and reprograms their brains into relentless, aggressive savagery which is suggested to be worldwide (though populous nations where enormous swathes of people are without comprehensive cell service like India and China are not addressed). Again, the implication is that a large percentage of the US is wiped out, though nowhere near as convincingly as in “The Stand”. Clay Riddell, a graphic artist, embarks on a quest to reach his son in Maine, gathering around him other characters, primarily a gay middle aged Tom McCourt, and a teenage girl named Alice Maxwell. As they move through a wrecked Americana, they become aware of a dark antagonist in their dreams, The Raggedy Man, who is organizing the rather more subdued “Phoners” into flocks that deliberately expose every normal person to the Pulse in order to make everyone into a Phoner and then…well, let’s just leave it there and not indulge in spoilers. King’s ambivalence to technology here is quite marked, and calls to mind other pieces from his earlier career, like “The Mangler” and “Trucks” or “The Tommyknockers” which are also about the way people are affected (badly) by technology they only dimly understand and which almost becomes their undoing. The psychic scar of September 11th permeates the book, directly or via conversations about terrorism, the 911 on the picture on the cover, or our own inferences that this might be an insidious form of terrorism taken to another level. 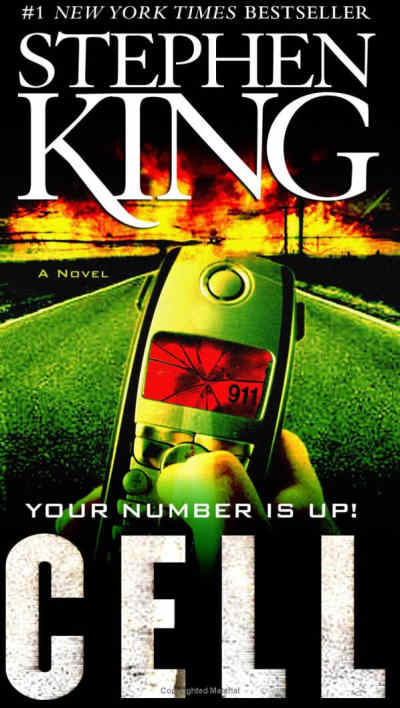 Still, I think King enjoyed writing “Cell” because when I did a small concordance of his references (whether in themes or outright similarities), I found no less than thirty one instances where he touched on or implied other stories or presaged still others. Aside from the ones I’ve already noted, there is a character called Charles Adai who may be named after the publisher of King’s “The Colorado Kid”; the wild talents of the crazies or the survivors suggest “Carrie”, “The Shining” and all those other novels where people experience psychic abilities; The Raggedy Man could be any of Flagg’s incarnations; and the gay McCourt could be informed by “Insomnia’s” Bill McGovern…and so on. And there’s a lovely bit towards the middle, where the normals only come out in the night to escape from the preying Phoners who move around in the daylight that is nothing so much as a reverse vampires story, tweaking the nose of that genre ever so slightly (down to the Van Helsing-like character who maps out strategy but, alas, doesn’t make it). The ending of “Cell” is of peculiar interest, because the title of the book begins to have multiple meanings: the phones themselves, the resistance cell Clay forms with his band, and the concept that brain cells may be reset like a computer rebooting – and this leads into one of those famous ambiguous endings when Clay does find his son and the closing notes are inconclusive. Yet there is hope, and in that the reader must be satisfied. In short, I can’t say that the novel as a whole works for me – unlike the Last Hippie, I’m not a rabid, brain-dead zombie fanboy, though I do have an affection for it when done well – yet on its own merits, as a breakneck (and more thoughtful) piece of prose relating to our reliance on technology and the resilience of humanity as a whole, it pushes all the right buttons. Certainly we had no shortage of words to discuss it on the night the novel came up, and we were still more or less sane when the evening was over. If perhaps a little worse for drink.